Some users of Samsung Galaxy Note 3 have reported a problem they encountered during Wi-Fi calling, in which most calls will not go through when Wi-Fi calling mode is active. The problem specifically occurs when a caller from out of state calls to the user's phone and the phone cannot receive the call. What causes such problem to occur on your device? Wifi calling issues, including cannot receive Wi-Fi calls or call quality is not good, could be due to a wifi issue or a phone problem. Following are recommended workarounds that may help you resolve the problem during WiFi calling when most calls cannot be received on the Galaxy Note 3. 1. Make sure you have a high-speed Internet service. Try to use speedtest.net to see if you're actually getting enough speed for this purpose. The acceptable upload speed is 26Mbps above. Lower than that means the problem is with the Internet connection. Please contact your ISP if this is the case. 2. Ensure you're connected to a Wi-Fi and within the acceptable range from the router that is 15 feet away. 3. Verify the wireless router and ensure it is connected to the modem directly. 4. Make sure the wireless router is updated or on the latest firmware version. You may need to contact your router manufacturer if you're not sure of it. 5. Try to eliminate any possible interference to the Wi-Fi including machines or appliances nearby, 2.4 Ghz baby monitors, 2.4 Ghz cordless and Bluetooth-enabled devices. 6. Turn off the router, modem and your Galaxy Note 3 for about a minute. 7. Turn on your modem first. 8. Wait until the modem has established an Internet connection, then turn on the router. 9. Wait until the router connects to the Internet, then turn on your Galaxy Note 3. 10. 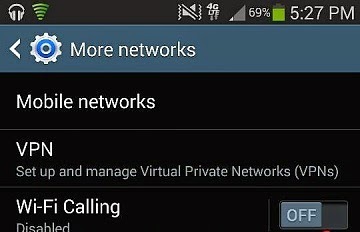 Set the WiFi calling connection to "network preferred" and try to use Wi-Fi calling again. If problem continues, please contact your network carrier or ISP for further troubleshooting assistance on Wi-Fi calling issue with your Samsung Galaxy Note 3. The above steps worked for some Note 3 users who have encountered the same issue. Hope these will do the same for you too.